The BBC began legal action against HarperCollins last week. It says it won't confirm or deny that Ben Collins either was or remains The Stig. But Top Gear presenter James May, who was a studio guest on BBC London when High Court's decision was announced, made light of the situation. He said: "Obviously I'm now going to have to take some legal action of my own, because I have been the Stig for the past seven years, and I don't know who this bloke is, who's mincing around in the High Court pretending it's him." The Stig is famous for his racing overalls and dark-visored helmet. His identity has long been a closely-guarded secret on Top Gear - one of the BBC's most popular shows in the UK and around the world. Several racing drivers have been linked to the role, including former Formula One world champions Damon Hill and Michael Schumacher. Mr Collins, 35, from Redland, Bristol, was in court for part of Wednesday's hearing. 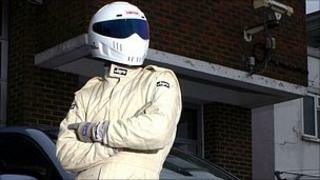 The first Stig, Perry McCarthy, was dropped in 2003 after his identity was uncovered. During the case this week - which took place behind closed doors - the BBC had argued that the planned book would breach confidentiality obligations. After more than a day of legal submissions before Mr Justice Morgan, HarperCollins lawyers emerged on Wednesday to say the case had concluded in their favour. Solicitor Robin Shaw said: "The judge has said he is not going to grant an injunction in this case. Reasons are to follow and will be given in a private judgement." A BBC statement said: "The Top Gear audience has always made it clear that they enjoy the mystery surrounding the identity of The Stig and the BBC felt it important to do all it could to protect that anonymity. "The BBC brought this action as we believe it is vital to protect the character of The Stig which ultimately belongs to the licence fee payer. "Today's judgement does not prevent the BBC from pursuing this matter to trial and the BBC will not be deterred from protecting such information from attack no matter when or by whom it should arise." The court case follows newspaper speculation last month that The Stig's true identity was Mr Collins, based on the financial reports of his company. At the time, the BBC said it was "no surprise" that Ben Collins' company listed Top Gear amongst its work as the driver had "appeared numerous times on the programme and he often supplied other drivers for both the programme and Top Gear Live".